I've never seen an episode of Game of Thrones. I'm not even sure I could tell you why so many people love it or what the basic premise is. The reason I tell you I'm not familiar with this pop culture phenomenon is because it's inevitable the star of The Forest will garner much good will for her leading lady debut due simply to the fact she's a seemingly well-respected character on that hit TV show. Because I only recognize Natalie Dormer from The Hunger Games: Mockingjay films I have no frame of reference with which to know what I should or shouldn't have been expecting from this January horror release. Of course, that is the other major factor in how one will perceive The Forest before seeing it: it's a January horror release. Generally, studios tend to dump their scrap pile on audiences in the month following the barrage of Oscar hopefuls that they (the studios) hope will continue to earn money throughout awards season while simultaneously clearing their shelves of any long-gestating projects that simply need somewhere to die. In this sense, January is more or less a graveyard of long lost B-movies that will make a few bucks and then disappear after a single weekend never to be heard from again. Once again, in this sense, it seems pointless to even write a review for something like The Forest which will so clearly be dismissed and then buried beneath the rest of January's dull releases to the point by the time this thing comes out on DVD and Blu-ray three and a half months from now most people won't even remember it came out in 2016. Still, I was hopeful that the seemingly buzzy Dormer would make good on her promise of being a performer of integrity and buck the trend of January horror films to deliver something both psychologically disturbing and legitimately scary at the same time. Instead, The Forest is one of those horror movies that feels as if it was pieced together by a creative team that's only watched a few bad horror flicks and still decided they knew well enough what they were doing to take their own crack at it. Relying solely on cheap jump scares and a supposed twist ending that were clearly meant to have audiences reeling, The Forest will instead only leave most dumbfounded that we're expected to be impressed. wander deep into the Aokigahara Forest in Japan. To its (and Dormer's) credit, the premise is at least engaging. Based around the Aokigahara Forest, a real-life place in Japan where people go to commit suicide, the idea is that there is an added layer of mysticism to this place. In essence, what writers Nick Antosca, Sarah Cornwell, and Ben Ketai (yes, it took three writers to slap this thing together) have done is to make the titular forest one where the freaks come out at night and prey on those in weak emotional states which, given most people are there to off themselves, is pretty much everyone. What the story doesn't do is commit to this idea. While it might have been interesting to see our protagonist, Sara (Dormer), slowly descend into some kind of madness where neither she nor the audience knew what was real and what wasn't (and it leads you to believe that's where things are headed), the film instead decides to make Sara's quest to find her missing twin sister, Jess (also Dormer), one that is incoherent, clumsily crafted, and ultimately doesn't answer any of the potentially interesting questions it poses in its second act. We are never given any reason as to why Jess, a teacher serving a period of time in Japan teaching natives how to speak English, decides to wander into a suicide forest or why she might be missing for an extended period of time. Whereas the film decides to set up a few possible motivations for conflicts that Sara will encounter upon entering Aokigahara none of these pan out in any kind of satisfying or revelatory fashion. Instead, the film bops along as if unaware of its countless missteps. 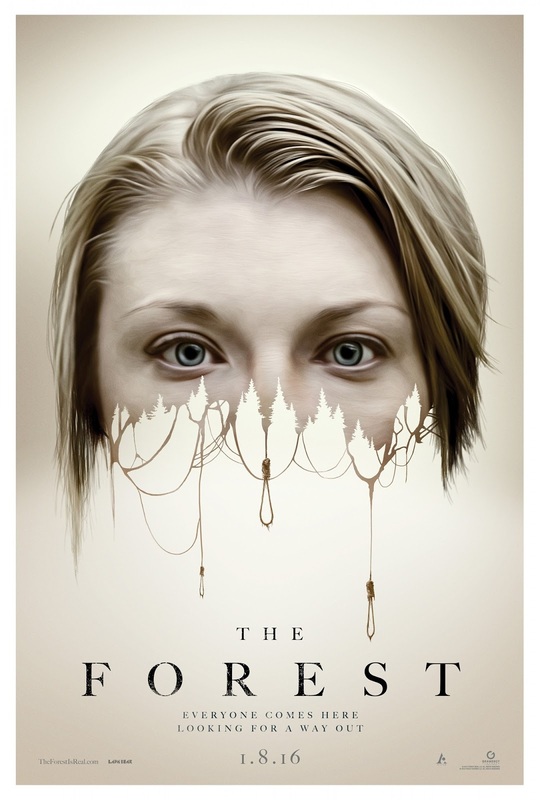 Essentially, The Forest is a movie about a young woman who comes to search for her twin sister who has mysteriously disappeared and while that is all well and good what the movie ends up being is a piece of wannabe horror that will have any reasonable adult yelling at the screen due to the stupidity of not only the characters, but the screenplay. Beginning well enough director Jason Zada (who has zero noteworthy credits as far as I can deduce) and his editor cross edit scenes of their inciting incident and the necessary exposition to set up the story. Both efficient and mostly effective I was immediately willing to jump on the opposite side of the bandwagon and began convincing myself I might actually be able to enjoy this movie-maybe even serve as the voice of reason when it came to these January releases that most seem to instinctively pounce upon. Given our blonde, conservatively dressed Sara arrives in Japan to search for her rebel-rousing sister within five minutes though, things quickly stall. It becomes clear quite quickly that once the exposition dialogue is covered and the three screenwriters realized they were going to have to craft actual conversations from this point on things took a turn for the ugly. The dialogue is pretty painful-and that's being kind. There are plenty of cringe-inducing lines that don't bear repeating, but the performers can only do so much and even here-things aren't great. As Sara, our lead protagonist, Dormer is fine enough. As Jess, the sister the story revolves around, but who we barely come to know, she is actively bad. Given we're with Sara most of the time though, Dormer's convincing enough, but she has paper thin character traits to work with and the only substantial relationship we see her develop is one that's intentionally ambiguous to the point the actress is basically playing against nothing. That isn't to say Aiden (Taylor Kinney), a mysterious journalist who initially seems to want to court Sara before making his actual intentions strangely conspicuous, is bad he's just blah-there's nothing there. Kinney is a capable actor who has a great screen presence, but much like Dormer he has little more to do than stand around and look pretty while staring into the lush green forest. Once Sara arrives in Japan there's no forward motion. The story simply grinds to a halt for a long period of time with Zada and his screenwriters seemingly only concerned with finding different sets of circumstances they might place Sara in so as to deliver a quick jump scare. 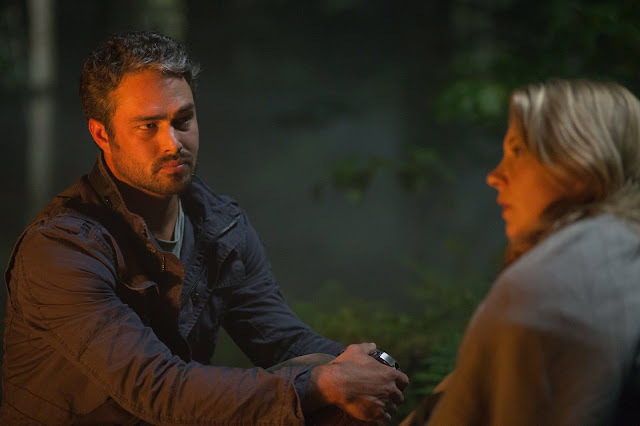 Aiden and Sara share a nice conversation over a warm fire in the suicide forest. Unfortunately, and despite my early optimism, The Forest will not be the January horror film to buck the trend of terrible January horror films. The Forest is one of those scary movies where unassuming souls venture into an environment that is so obviously destined to bring them misfortune that it's hard to even feel sympathy for the characters. The writers attempt to give our heroes a valid reason as to why they would go against such odds, but never flesh out those reasons enough to convince us those same heroes aren't simply ignorant. If you're looking for good horror where people venture into places they know they shouldn't go, but do anyway than look no further than The Descent or even The Ruins as you're appetite for scares, thrills, and gore will all be appeased by either whereas The Forest will leave you pulling your hair out over its futility rather than its frightfulness. While I hate to completely dump on a movie there is hardly anything redeeming to say about this piece of schlock. Some of the visuals are pleasing due to the nature of the environment and after Sara and Aiden spend their first night in the forest there are some genuinely interesting questions put in place, but due to the fact the actions of our protagonist remain consistently mindless and the execution of how the script goes about answering these questions there is no substance to the revelations and no weight to the intended emotion. The movie gets in no more than one legitimate scare that has to deal with a creeper at a campsite that is made frightening by keeping the audience strictly in line with the point of view of the person inside the tent, but this only lasts a brief moment before it is upended by some unintentionally hilarious line of dialogue or super awkward cut (and there are a lot of those here). It's almost as if the writers didn't know how to tell the story they wanted to tell and so instead of trying to work that story out they instead abandoned any thought of character development, depth, and even authentic dialogue in exchange for pitiful scares and even more pitiable characters. In short, you should skip this one even when it's on TNT in two years.